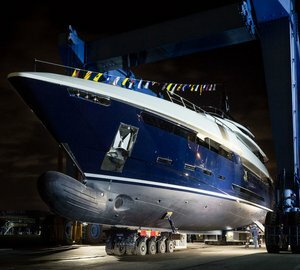 The 55m/181ft DISPLACEMENT LUXURY SUPERYACHT was built by Italian shipyard Rossinavi in 2008 and last refitted in 2018. 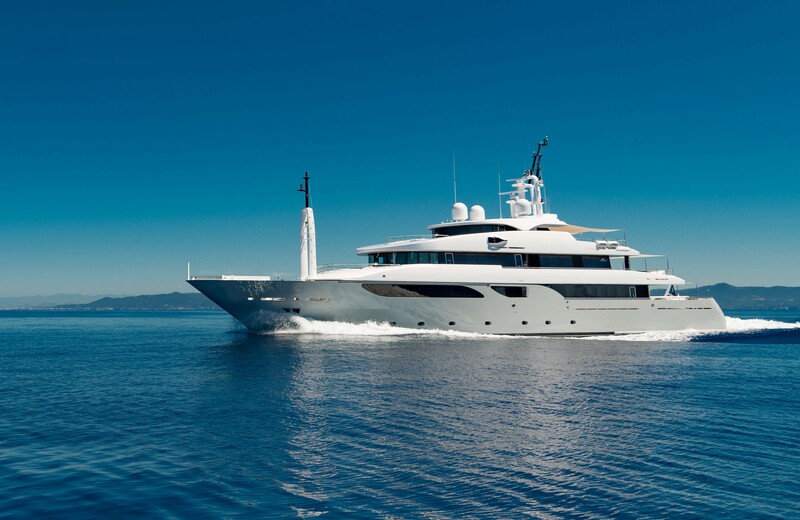 Constructed with a steel hull and an aluminium superstructure, her naval architecture comes from Alessandro Cusamano and Cristiano Gatto Design produced her beautiful contemporary interiors. The accommodation sleeps a maximum of 12 guests across six lavish cabins while a crew of 12 makes sure everyone has a fantastic and carefree charter holiday on board. The lower deck swim platform provides easy access in and out of the water via a ladder and there is plenty of room for sunbathing. Staircases lead up to the main deck aft, where guests can spend their time in the sunshine or shade, relaxing on the stern sofa or the plush armchairs surrounding the coffee table near the glass doors to the main salon. An outdoor stairway leads to the upper deck where there is a dedicated alfresco dining table to seat all guests. Sunpad seating is fitted along the stern and similar to the main deck aft, this area can be shaded by a canvas if required. On the foredeck a C-shaped sofa curves around a raised table, providing a space for alfresco dining and all-day outdoor living. The sundeck is divided into the aft section and the forward section, with the latter offering an abundance of sun loungers and double-sized sunpads with canvas shades available. The sundeck forward provides guests with a quiet and secluded sunbathing space for soaking in the Jacuzzi before drying off on the sunpads and watching the sunset. The lower deck hosts the guest accommodation, which consists of two double en-suite cabins and two twin en-suite cabins, with the crew accommodation placed within the bow. On the main deck forward the full-beam Master suite benefits from large windows for a naturally lit interior, within which there are two chaise-loungers, a walk-in wardrobe, study and en-suite bathroom. The VIP stateroom is also located on the main deck and also has its own en-suite bathroom. Behind the foyer is the formal dining area, where elegant velvet dining chairs are placed around a grand Makassar dining table. Contemporary artwork adds a pop of colour to the surroundings, where the symmetrical main salon places a sofa between two plush armchairs on both the port and starboard sides, with coffee tables and lamps completing the setting. The upper deck offers guests an alternative relaxation area in the glamorous skylounge, which uses cream furnishings for a lighter daytime environment. Two large L-shaped sofas and footrests are placed near the upper deck aft sliding doors, while a large drinks table is placed forward for six guests to converse over cards games. A third lounge is positioned behind the helm station, while the sundeck interior provides a comprehensive gym where guests can work out and savour the views before resting in the winter garden to the aft. 2 X Caterpillar 3516 1640kw producing 2231 HP allows for a top speed of 15.5 knots, a cruising speed of 12 knots and a range of 6,000 nautical miles. The accommodation provides for up to 12 charter guests over 6 en-suite cabins: 1 Master suite, 1 VIP stateroom, 2 double cabins and 2 twin cabins. The crew of 12 will ensure that everyone on board has the first-class service throughout the cruise. We do have available further amenity, owner and price information for the 55.00m (180' 5") yacht 55M DISPLACEMENT LUXURY SUPERYACHT, so please enquire for more information.